Paddy Power is the most used sports betting apps in the UK & Ireland. Paddy Power are famous for betting promotions and money back specials. PP focus strongly on English Premier League football betting and UK racing. Newly redesigned app for quick and easy betting. Login with a pin number. Paddy Power is known as one of the most colorful and exciting bookmakers in the industry. They offer some of the craziest bets out there and you will find all of them in their mobile application. It is the most popular sports betting app in the United Kingdom and deservedly so. The software is smooth and easy to use in terms of functionality and offers all important features required for a great betting experience. The list includes pregame and in-play betting markets, live streams of lots of horse races, and also good promotions. 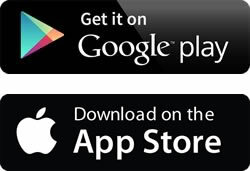 The app is compatible with iPhone, Android, BlackBerry, and Nokia, while it also has a tablet-dedicated version. This means you can bet from almost any device out there. 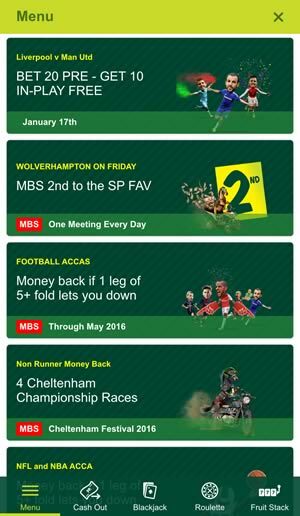 The Paddy Power mobile betting app is designed to copy the experience from their web service. The user interface and navigation are similar and most of the features are implemented. You can easily place your bets, take advantage of promotions, or even watch live streams on your iOS or Android device. 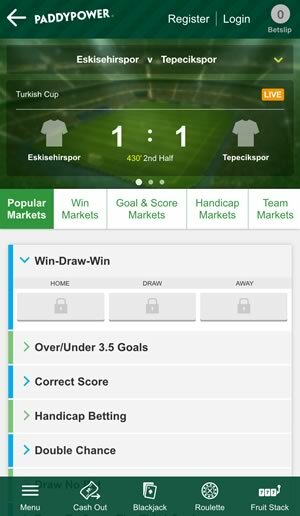 ​Live betting is the preferred choice for many people nowadays and Paddy Power knows that and you will find all the same in-play odds from their Android app. 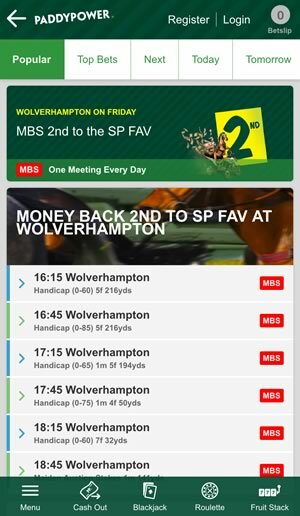 ​To take advantage of this feature, just tap on the Live Betting menu in the top screen bar. You will be displayed all events available, with odds and scores updated in real time. Just choose the match and take a look at the markets. 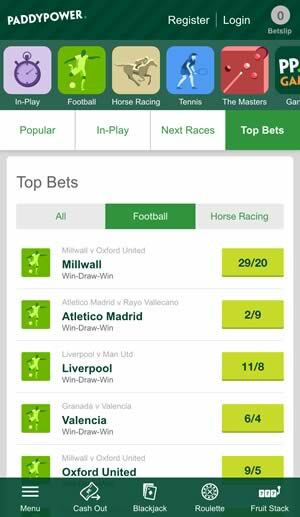 The Paddy Power mobile app covers football, American sports, horse racing, basketball, and many more. This provides the perfect platform to bet anywhere anytime from your mobile device. Paddy Power made sure to add live streaming to their mobile app, so you could watch all UK, Irish, Dubai and South African horse races from your phone or tablet. To be eligible for that feature, all you need to do is bet 1 EUR or GBP on the race you want to watch. After that just tap on the Racing menu in the bottom right corner and find what you’re looking for. Fans of horse racing will be glad to know that Paddy Power has a partnership with the Racing Post to provide exclusive content. They provide a wide range of horse racing information with stats, expert analysis and predictions for most races. 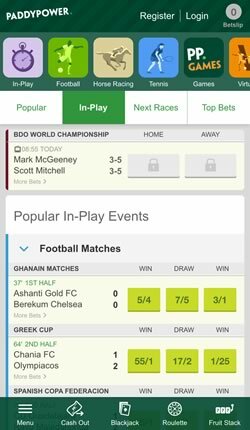 As in their web service, Paddy Power offers a Cash Out option on Android and iPhone also. All you need to do is tap on the Cash Out menu in the bottom part of the screen and all your eligible bets will de displayed. This is a great way to protect your investment and have control over you wagers at any given moment. Your team is winning, but you think they are under pressure and want to collect while you can? No problem, just open the app in your phone and close your bets. The Cash Out amount varies, depending on the current status of each event you have bet on. ​Paddy Power also offers virtual sports, so basically there is always something you could watch and bet on. They are available 24/7 and provide the opportunity for some in-play excitement when there is nothing else out there. As one of the biggest gambling operators in the industry, Paddy Power offers odds on a wide range of sports and events. The amount of football leagues covered is staggering, including all the major ones such as the English Premier League, La Liga, the Bundesliga, Seria A, and all UEFA and FIFA competitions. You can also bet on the big American leagues such as NBA, NFL, NHL, MLB, and MLS. Other sports covered are horse racing, greyhounds, volleyball, darts, snooker, and many more. Besides the traditional markets, there are multiple prop and side bets available. In fact, Paddy Power is known for offering some crazy and exciting stuff no one else does. For example, they have odds on who’s going to play Jamie Vardy If Hollywood makes a movie about his life! If you’re up for those sorts of things, that’s the place for you. The min bet Paddy Power allows is 0.40 GBP and the max depends on the event. Normally, it is about 10,000 GBP. The juice is about 8%, which is around the industry average. Installing the app is very easy. If you can go to the Paddy Power website from the browser of you device, a pop-up will appear in the top part of the screen, just click on it and install. Alternatively, you can visit the dedicated app store and search for the Paddy Power mobile application. The Paddy Power mobile application is one of the best Android sportsbooks out there. It provides the perfect platform for pre-game and in-play betting, as also the option to follow live games. The design is nice and the navigation is easy. They cover pretty much any mobile device out there too. It is a nice addition to their excellent web service with a huge variety of markets and daily promotions.